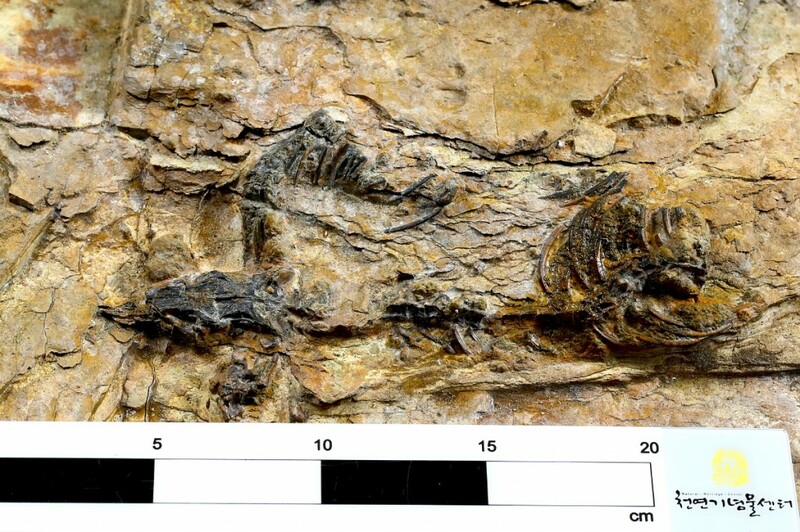 SEOUL (Yonhap) — A complete skeleton of a small carnivorous dinosaur has been found in southern South Korea, the first such discovery in the country, a state think tank said Monday. Theropods, or “beast-footed” dinosaurs, are of the same family as the Tyrannosaurus, one of the largest land carnivores to have lived on Earth. “The way this dinosaur has been fossilized is unique in that it was discovered with its vertebrae connected to its ribs,” the institute said, adding there seems to be another individual fossilized in a rock next to it. Other specimens discovered in the stratum in Hadong, aged some 110 million to 120 million years, include those of a Pukyongosaurus, a long-necked herbivore native to Korea, and pterodactyl teeth.